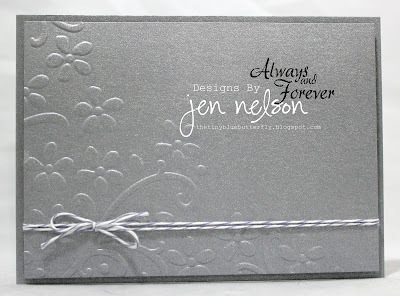 You don't necessarily need to have the word Anniversary on the card but we'd like it to be suitable for the occasion. The choice of theme this week is most indulgent on my part, as today is my 39th Wedding Anniversary. I don't think I'll be getting a card from my husband until a little later in the day... it was raining yesterday and being a last minute merchant as far as card buying is concerned, he didn't want to go out and get wet...so he hasn't got one yet. He has made dinner reservations however and I know which I prefer. Here's my card for him! For this card I heat embossed three pieces of card, one with the script stamp, one with the paisley and one with the manuscript, which I then proceeded to die-cut with the Die-Namics hexagon die. These were mounted on the larger hexagons cut in silver. The flourish is from Marianne's I believe and the sentiment is is from a Woodware stamp. There are a few more examples on my personal blog! For this weeks theme I wanted to try something a little different. 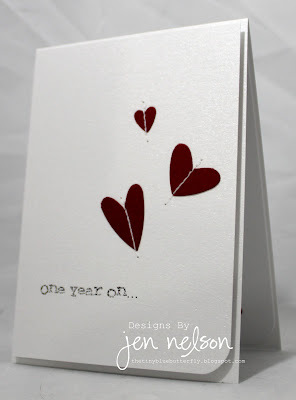 For my first card I printed the words "One Year On" in typewriter style font and then using the Stampin' Up heart punch I cut red pearl card and then added the hearts by using my sewing machine down the centre. It's finished by rounding off a corner. Simple, but lots of white space!! For the second card, I printed a simple sentiment and then placed the card into a Stampin' UP embossing folder, just trimming it to fit the card blank in the same colour. It's finished off with some SU wisteria wonder twine. Sorry the photo isn't great, pearl card looks fab IRL but not so much in the photos. Not many sleeps left until Christmas now, I hope everyone's preparations are well under way. Do join us in this challenge, we're always amazed by the wealth of talent amongst LIMettes! Fabulous examples Ladies, will get my thinking cap on while I am out this morning. Hope to join in today instead of the end of the week! and happy 39 th anniversary!!! Gorgeous cards again this week. Chrissie, hope you have a wonderful 39th wedding anniversary meal tonight - I'd rather that than a card any day! Happy Anniversary Chrissie !I liked all the cards .very elegant and beautiful ! Happy Anniversary Chrissie! Beautiful cards! Happy Christmas to you too Nessa and thanks for your kind comments. You can always email your entries to us even if you don't have a Blog you know! Hi Crissie, HAPPY ANNIVERSARY, enjoy your meal. I did manage some challenges this year and as you know I did the last one, my health has been very bad (M.S. etc) but I aim to try very hard to do at least 1 challenge each week in the New Year, I have always loved the simpler styles, and for some challenge you have to stick so much on it ends up OTT. I am looking forward to next years challenges. I wish you and your "A VERY MERRY CHRISTMAS AND A HAPPY NEW YEAR, chill and enjoy, love Carole Lockhart Stuart.